Above the library in the church was a quaint meeting room like an after-thought finishing of an attic–an upper room. The ceiling angled to a point, stretching as if it begged to reach heaven. It felt comfortable and safe. Every Sunday, our Sunday School class would meet there. An elder couple led the group of couples ranging in age from early 20’s just married to mid-thirties with kids. I was in the early 20’s group and had recently given my life to Jesus. Feelings of unworthiness haunted me in spite of the comfortable and safe upper room. “What if they knew?” My thoughts tormented me. Then one day I couldn’t take anymore. I don’t remember the question but my heart was pounding like if I didn’t answer it would burst out of my chest. In between sobs, my words cascaded like a waterfall dammed up and then let loose. Darkness clouded my vision, my sight blurry from tears and eyes partly shut. It was as if part of me rationalized if I can’t see them, they won’t see me. Maybe they won’t truly see me. Jesus has saved me from so much. I’m not the same person I once was. I’m ashamed of who I was and I fear you wouldn’t like me if you knew what I have done. I don’t feel worthy to be in this class or with all you wonderful people. You all seem like you have known Jesus forever. I’m afraid I’m not good enough to be here. After exposing my heart and fears to this group of about 20 young married couples, I’m not sure what I expected. Perhaps I was looking for a “Me too” or “I understand. I’ve been where you are and you are not alone.” I’m not sure they knew how to respond to all that raw pent up emotion breaking loose. Then the bell rang and I sat, slightly unsure of my next move. Maybe I was alone. Then one girl responded. She was a new friend. I didn’t really have Christian friends yet, but she was becoming a friend. She responded— the only one. She walked up to my chair. It was a moment forever etched in my mind. Instead of running from my need, she embraced it. Her words were ones of invitation. She wanted to know me. She wasn’t afraid of my brokenness. She saw me, truly saw me and decided I was worth knowing. Isn’t that the longing of every human heart–for someone to decide you are worth knowing? And we are still close friends today, nearly 19 years after that initial invitation in the upper room. Feelings of unworthiness are common for men and women who have experienced abortion. 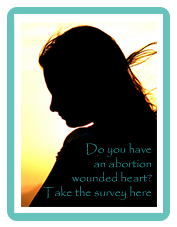 Feelings of being less-than cause those with abortion-wounded hearts to choose less-than. My friend knew something I didn’t know at that point in my life—Jesus didn’t see me as less-than. Jesus doesn’t see me as less-than. Jesus sees those with abortion-wounded hearts as in need of a healer. He doesn’t run from the need. In contrary, He embraces the need. He embraces you. He invites you. He isn’t afraid of your brokenness. He truly sees you and decided a long time ago you are worth knowing. You are not alone. You are never alone and never have been alone. Your healer delights in you and desires a close friendship with you. Jesus is just waiting for you to respond to the invitation in the upper room. If you have had an abortion and have struggled with feelings of unworthiness or feeling less-than, you can go to www.godeeperstill.org to find out how to register for a retreat. This is your invitation from the One who responds to your every need. Lord Father, we pray for those who feel unworthy due to the sin of abortion to find healing, freedom and truth. Lord, thank you that you never run from our need but instead, you run to us and embrace our need. Lord, we pray for those with abortion-wounded hearts to rise and come to you and receive their robe of righteousness and ring of worthiness in the Son. In Jesus’ Name, Amen. Please subscribe at the top of the page to receive devotionals in your email to pray for the healing of those wounded from abortion.